J.M. 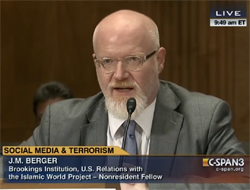 Berger appeared on NPR's Fresh Air with Terry Gross on Monday, March 25, discussing recent developments in extremism, including the New Zealand right-wing terror attack. For full audio, click here. For more on the topic, check out J.M. Berger's new book, Extremism, from MIT Press available from bookstores everywhere, including e-book and audiobook formats.